Funeral service for Emma Pearl Woods, age 102, of Sulphur Springs, will be held at 11:00 AM on Saturday, February 2, 2019 at Miller Grove United Methodist Church with Brother Howard Strickland officiating. Interment will follow at Miller Grove Cemetery with Kent Renshaw, Darren Renshaw, James Oler, Dan Brown, Mike Nabors and Matthew Duckworth serving as pallbearers. Visitation will be held from 6 to 8 P.M. on Friday, February 1, 2019 at Murray-Orwosky Funeral Home. Emma Pearl Woods died peacefully in Sulphur Springs on Friday, January 25, 2019. Emma was born August 14, 1916 in Miller Grove, Texas and was the seventh child of John and Ida Renshaw. She married Raymond L. Preston of Miller Grove in 1932. 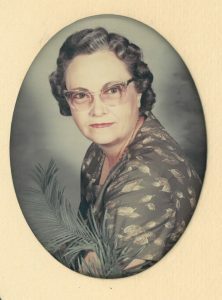 They lived in Miller Grove until the 1950s when they moved to Ft. Worth where she worked for Woolworth Co. until the late 1960s when they retuned to Hopkins County and built a home in Miller Grove. She continued to live in Miller Grove and was a lifelong member of the Miller Grove Methodist Church serving as the Secretary and later as the Secretary/Treasurer for the Cemetery Committee. She was preceded in death by her first husband Raymond Preston in 1977 and later by her second husband Joe Woods in 2009. She is survived by her nephew, Johnny D. Duckworth of McKinney and her niece, Ora Faye Nabors of Dallas along with numerous great nieces and nephews.